These Finger Guards from Rhoost, are the perfect solution to finger smashing doors and doorjambs. Made from 100 percent recyclable material, the Finger guards are created with a smooth, simple design and will ensure protection for your little one’s tiny fingers against hinges, and slamming doors. Created and designed to be functional and stylish, as well as much simpler to use and install. 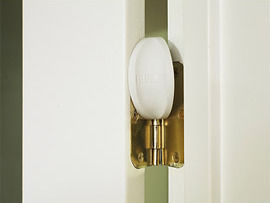 No flame retardants or chemicals used in making these essential finger guards, these are non-toxic and come with no glues or screws, and will fit on virtually any size door hinge.